This thread is dedicated to K-doll. Kill_U, Kian, Kayan, Kill_U 2nd, Kill_U SP, Kamyu, Karon, Kael, Karen, Kasis, Khan, Keikei and Kasiel. Just saw the completed pictures of Keikei! 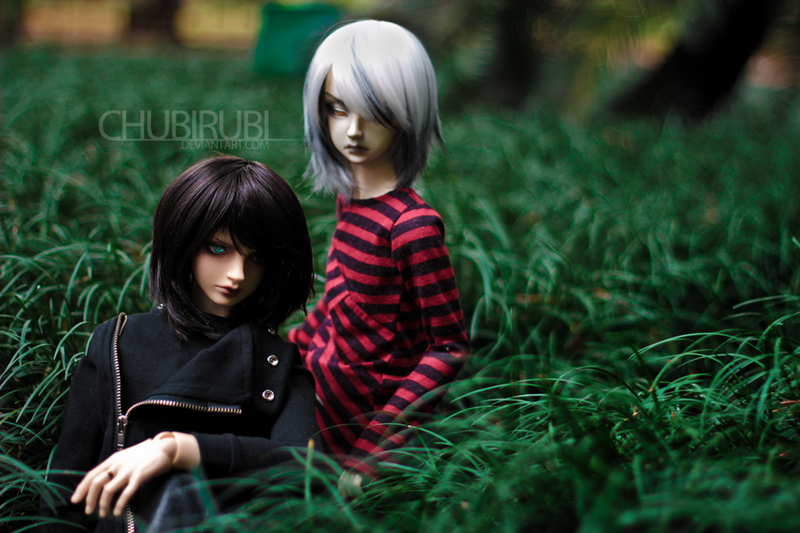 I agree chubi, he has a dash of classic Kdoll, but I feel that Kdoll's style has evolved so much over their hiatus. ^^ I'd love to see what people will do with him/her. It's a great head that looks versatile of gender. I'm loving Keikei! He is like a younger brother of the older DiM heads. Also, the only one who could convincingly be either a boy or a girl (IMO). I thought so too! Specially because of those huge, expressive eyes (: Kind of a big leap from Khan though, who has very realistic proportions. I hope you do, cause I expect to see lots of Keikei around!! Although I need to be downsizing (and plan to get to only three or four dolls), he was irresistible so one normalskin head will be coming to live with me. Wish he came with that micazuki faceup! I'm planning on eventually getting him the new Dollstown 15 boy body. Any suggestions for other boyish bodies? I've only had a Kian head and admired all of the other sculpts. I'm guessing there will be more 60cm compatible heads to come - thank goodness! I really love her Khan but he's so big! Although I love Dollstown 15 boy body and think you should go right to it, I got for one of my Kill_Us a Doll-zone 60cm boy body (the most recent one) ^_^ It looks really good. It's a very cute and boyish body. I had my K-doll Kael on a Domuya 1SD male body and now on a DollFamily A-type body, and they both suited him very well. Keikei really is cute, but almost seems a bit smaller than the other K-doll boys. I love the lips, though! Thanks for the suggestions, guys! I looked at the Dollzone and DollFamily bodies and they're the type I'd like for this head. I really like the fact that they have the chest joint for some slouchy poses. Don't know why DT left it out of the new body. I was also looking at Sweet Gale's body but her sales are few and far between. I really like that Elegance body! Looks like the resin is much pinker than K-Doll's and that's the white skin, right? Your Kill_U is very cute. I've admired your boys on Flickr - really like your Kael! I'm a big fan of kdoll sculpt, I've placed an order for keikei can't wait to work on him! Thanks for the comparison shot! If I end up going with a DT body, I'm wondering if freshskin would be a better match than orientalskin. It certainly looks like a very pale normalskin. Freshskin is probably a good shot. From what I've seen, it has a pink undertone, while Orientalskin is yellowish. K-doll new Normal Skin is definitely pinkish. Also, I have a 2nd hand (probably yellowed) NS Kian that still doesn't have a body, and I was wondering what the resin match with the DZ body you have your kill_u on is like (since the photo is black and white lol). It certainly looks cute and slim like I tend to favour in bodies, over super muscular ones. I have a DZ 70cm body for my Gomidoll Igon and the color match is way off from my NS Kian, but that DZ body is also from like 2009 or something, so they've probably changed their resin, not to mention I think the 70cm DZs were a different color than the 60cm ones to begin with. Aw, I'm sorry! It's just that Kayan is not listed at the K-doll story section I must admit I kinda felt like there was something missing in the list... I remember Kayan's picture used to be with a black fur wig and his eyes were gazing to the side. Huum.. I'm not sure how the match would go, all my K-doll boys (except for Khan) are WS. The proportions, though, are really good! I'm definitely pleased with this combo. I've heard that Dollzone Normal Skin Yellow (at least nowadays) should be closer to an oldskin Volks tone, so maybe it's a decent match. (: I usually don't care too much for color match, since I can always make a nice blushing on the head. Thanks! I still need to do his eyebrows, lol. I wonder why K-doll didn't include Kayan... maybe she forgot too? :O Anyway, thanks for adding him to the list! I'd just recently put him on a body and I was lamenting the lack of active k-doll owners on DOA, but then this thread popped up ^^ Yay~ Maybe we'll see a resurgence of K-doll fans with this new keikei head. k-llection hahaha... K-doll is my favorite sculptor for heads as well (I have Kian, Kayan and Karon), it's the only one that I have multiple heads of besides Pixydoll (I have Dino and Sevy). chubi: I wonder why K-doll didn't include Kayan... maybe she forgot too? :O Anyway, thanks for adding him to the list! K-doll is my favorite sculptor for heads as well (I have Kian, Kayan and Karon), it's the only one that I have multiple heads of besides Pixydoll (I have Dino and Sevy). Huum.. If he's close to yellowed old Dream of Doll, maybe he's too light for Dollzone Normal Yellow? I'm so glad that K-Doll is back after such a long hiatus. Keikei is lovely, the head looks so well-made and detailed. Although I feel more drawn to realistic molds these days, I still love old school aesthetics with child-like features and larger eyes. Keikei looks pretty versatile to me, too, I can well imagine him as a girl. blackpaperback, your Kayan is adorable! I don't think, I've ever seen an owner pic of this mold. So, welcome, Key! I'd love to see more K-Dolls around. evie the kid: Thanks ^^ Your girl is beautiful, I love her faceup! Awww I'm so happy...! ;w; He's my favourite doll and character, so I'm always pleased to hear compliments on him. I've been admiring K-doll since 2008, when I discovered the company coincidentally while browsing BJD websites and fell in love with Kill_U (because he was just perfect for Cerberus, haha) right away. I'm deeply in love with him until now, so I currently own 3 Kill_Us LOL Two 1st and one 2nd. It's definitely my grail mold of all time. Your girl is lovely! I liked the shape of her eyes, it resembles Karon and Karen (: It's also the first time I've seen a female Kill_U.